backpacker indonesia : Solo Batik Carnival (SBC) will appear in the 2010 World Cup event to be held in South Africa, June 11 to July 11 next. After appearing in two countries, namely in the Chingay Parade in Singapore and Indonesian Night Market at Malie-veld, The Hague, Netherlands, SBC get an invitation from the Ministry of Foreign Affairs to perform in South Africa World Cup dalamperhelatan. "Solo was invited to enliven the event through its SBC Evidently the appearance of SBC able to attract international attention," he said again Further, according Pumomo, through his appearance in the two previous states, SBC gain international attention. 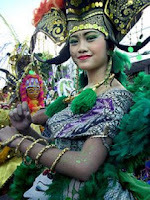 Moreover, SBC is a fashion show presented by using traditional batik clothing even though packaged in a carnival. Besides have been invited to perform at the World Cup, SBC also has received invitations from several other places such as Budapest (Hungary) and Berlin (Germany). In fact, the Ministry of Foreign Affairs also will bring SBC to the carnival in Rio de Janiero, Brasil.Motif shown in the SBC is a traditional batik that combines several themes in a motif fabric sekar universe. For example, the theme of the environment, ecology, flora, fauna, and the cosmos with the colors of diverse. Got Cirebon Factory "Yacht" and "Cruiser"